Sieve Bengal gram dAl and rice flours well to remove impurities. Add a ladleful of medium hot oil and mix it well with the flours. Now, add the remaining ingredients to this and mix thoroughly well. Add a little water to make it dry paste which should not stick to the hand but you should make a ball out of the mixture. Drop small balls of this mixture (lemon size) into hot oil which is kept under medium flame (since high flame will not fry the pakODA well inside). Once the pakODA turns golden brown turn the sides and fry again. Keep turning every now and then to avoid charring. Serve hot. No side dish required. by dropping a little batter for each bONDA by hand. When it turned golden brown I turned the side and fried again. This was very soft as the batter was ground in a grinder. We took it with SAMBAR but chutneys can also be tried. Prepare the batter for this by soaking Black gram dAl (1 cup) for 1 hour and grinding it after draining the excess water. To this batter add 1 tsp black pepper without crushing it, salt to taste and grated coconut (¼ cup). Some people use coconut cut into thin pieces instead of grating. Mix well and drop each dumpling (lemon size) in oil (medium flame) and fry well before serving. Good to eat with chutneys when hot. It is very tasty and softer. Since I made 9 bONDAs only I took 9 slices whereas you can increase the number to suit your requirement. Remove the crust of each slice and take the bread portion only. The crusts can be used to make bread uppumA, or as bread crumbs after drying it in the sun and powdering it. Pressure cook the potato, remove the skin and keep aside. Take the garlic and a few green chillies, make a paste and keep aside. Cut the remaining green chillies, onion and ginger into small pieces. Add mustard to hot oil and sauté with the cut green chillies, onion and ginger pieces. Add the paste and sauté for 2 minutes. Add red chilli, turmeric and garam maSAlA powders, fennel seeds, salt, sugar with mashed potato and sauté again for 5 minutes so that all integrate well. Add the chopped coriander leaves and stir for a minute. Remove from fire and add lemon juice. Divide into nine balls. Now take ½ a cup of water in a vessel and mix in it ¼ tsp salt and red chilli powder. If you have more slices, you can increase water a little more. Dip the slice (crust removed) just for a second and squeeze between your palms to remove the water. It becomes a sort of square bread sheet! Place one of the divided balls in the centre and close all the sides nicely as to cover the filling with the bread sheet. If need be, roll between your palms to make it spherical in shape. Drop in hot oil (medium flame) and allow the side to fry well before turning since it takes at least 2 to 3 minutes to fry as otherwise the bread cover will come out if you try to turn. After the whole bONDA is fried into golden brown colour remove and serve when it is not very hot but just warm with sauce. Alu (Potato) BONDA: For this, we take the same ingredients as above sans fennel seeds, garam maSAlA and lemon juice. For outer cover, we take ½ cup of Bengal gram dAl flour, 1 tbs rice flour, 1 tsp red chilli powder and salt to taste. The batter is made in the same way as we prepare for bajji. 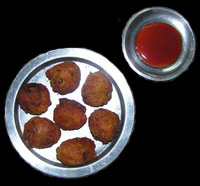 Here the filling balls are dipped in the batter and fried in oil as above. It is served with coconut chutney. Maharashtrians add fennel seeds a little more and a little lemon juice in their Alu bONDA. 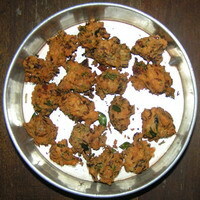 This entry was posted on June 3, 2011 at 11:13 pm and is filed under Miscellaneous Snacks with tags alu bonda, Bengal gram dal flour, besan, bread bonda, chopped coriander leaves, curry leaves, fennel seeds, garam masala powder, garlic, ginger, green chillies, lemon juice, medhu bonda, mustard seeds, Mysore bonda, onion, Pakoda, potato, raw Rice flour, red chilli powder, refined oil, salt, sandwich bread slices, soft bonda, sugar, turmeric powder. You can follow any responses to this entry through the RSS 2.0 feed. Both comments and pings are currently closed. Thank you! I had been hearing the word “PuDAchi vaDi” in our house for the last so many years but never had an opportunity to taste one or try one till Ramana Periappa made this at Raipur in 1979. Due to this blog, I thought of trying and accordingly first time made this. Really it came out awesome!! It was so spicy and tasty, you would really like. You need no side dish. But it is very hot!! Be careful!! Better to eat immediately after it is made to have the crispness!! Yes! I did recall our sessions at Charlottesville and Higland when I made the bread bonda. I always remember all of you whenever I make these as you really relish these. Pl let me know after you too try! I am really very happy to note Varadu’s comments and I know that he would make since all the children in our house are very fond of the sandwich! !